Moments before year 2017 calendars were hurled into bins around the world, I wrote an article listing my Top 10 Transformers of 2017. 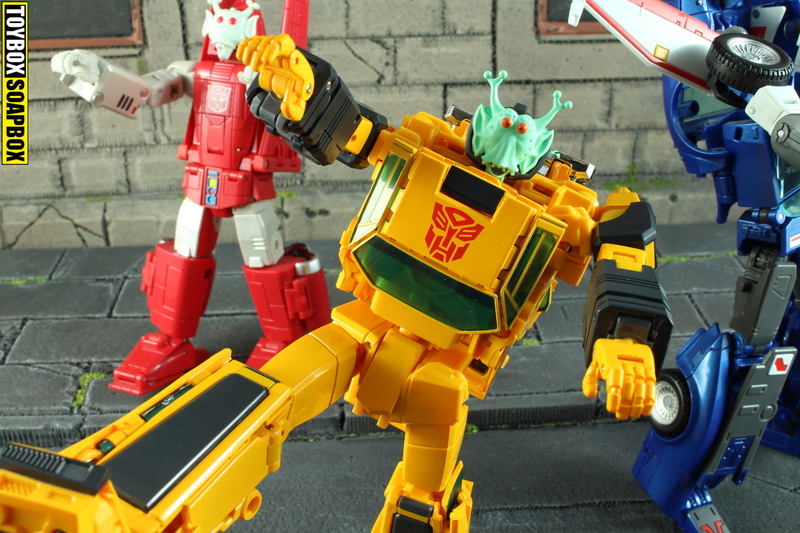 In it, I joked that I would get drunk and leave it far too late to do a review of Transformers MP-39 Masterpiece Sunstreaker. Quite fitting that I started it at Christmas, yet finish it amidst a mad snow blizzard that’s sweeping the UK….and long after everyone has lost interest in this toy. Sunstreaker is one of the original Generation One Transformers. He was in the first wave of the toy line, he was in the first series of the cartoon and he was also the first Diaclone toy. Yet he’s stylishly late to the Masterpiece party which he’d probably love. For whatever reason, it’s taken ages to get a Masterpiece Sunstreaker but he’s finally here to show off his impressive new tricks. Read on to the review. The Lamborghini Countach was the signature car of the 1980’s (yes, beating even the Austin Mini Metro), and to any child of that time it wasn’t unreasonable to assume you had one of those plastic framed pictures from the local market, or Athena, on your wall. I swear, when I won some prize tickets at a Skegness arcade last year they offered me one that’s been there since 1986 (I chose a Jurassic World mug if you are wondering). Understandable then, why it’s one of the most recurring vehicles spanning the entire Transformers universe. 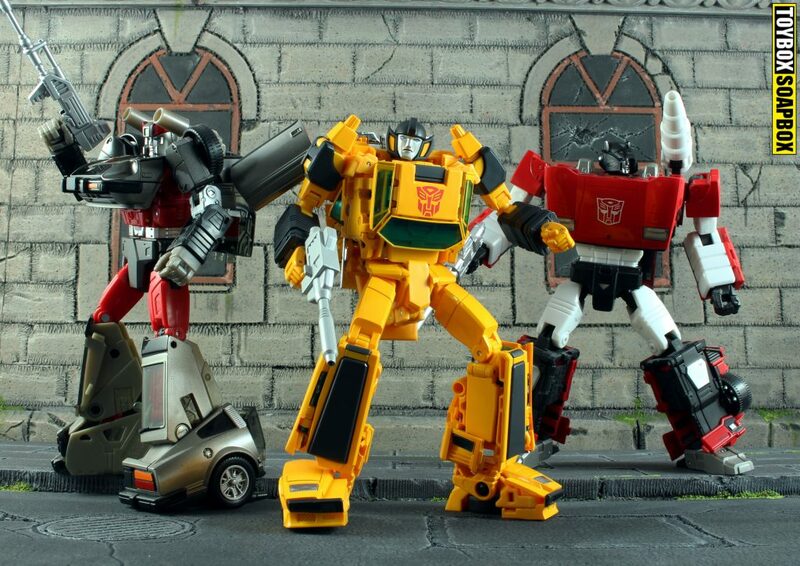 G1 rolled out with Suntreaker and Sideswipe, before adding Red Alert, Breakdown, Freewheeler and Flame/Laster (a toy I am particularly fond of) to the roster of era defining super car love. I’d struggle to think of another car that shows up so often across the brand. In point of fact, it’s pretty much the vehicle that Transformers was founded on. 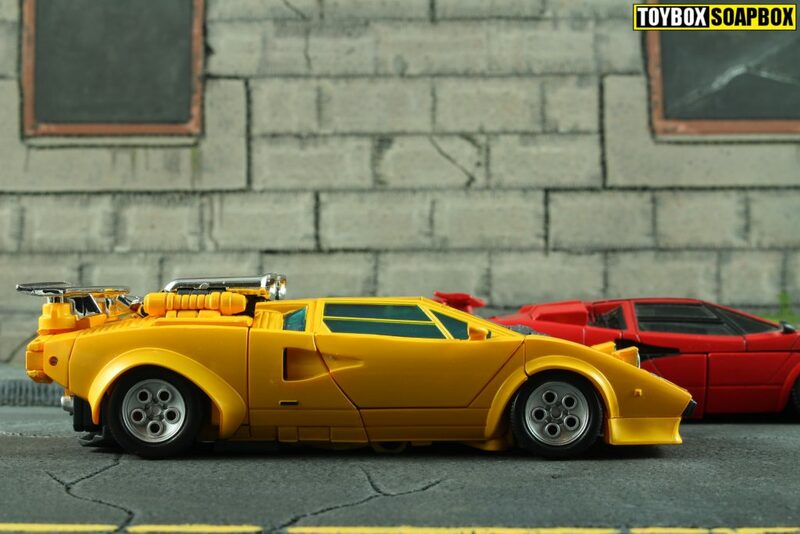 When Takara launched the original Diaclone toyline, the first toy to hit shelves was the Countach LP500S – the toy that would go on to become Sunstreaker. I am very good at reciting history from the TFWiki. 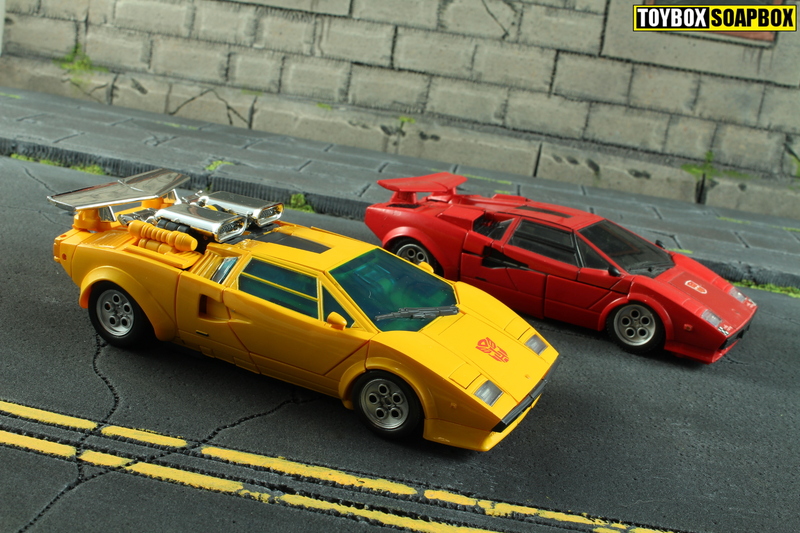 Arriving in Masterpiece as one of the final Autobot car stragglers, the result is nothing short of stunning. 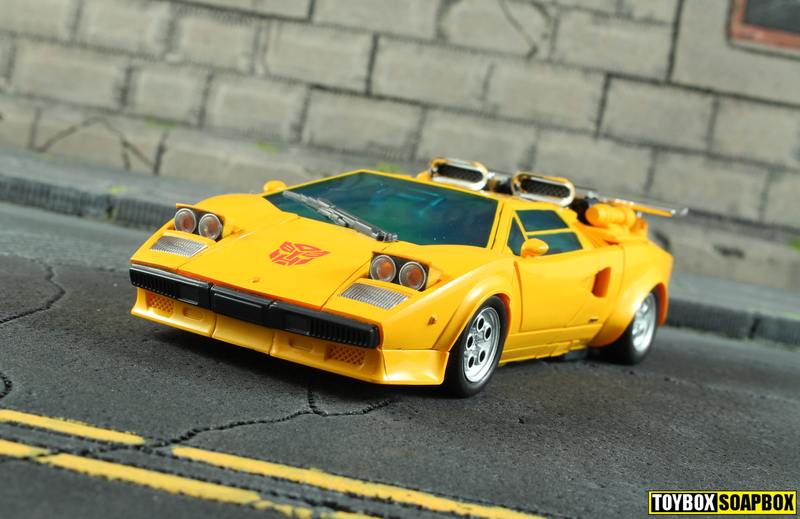 Sideswipe and his many recolours have almost exhausted the well of MP Countach repaints, but Sunstreaker banishes any thoughts of mode fatigue with a dazzling refresh of an iconic car. 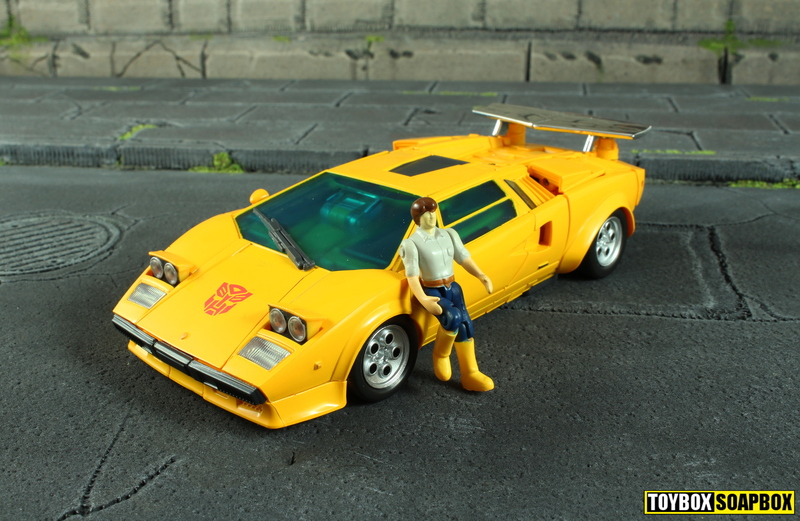 Tiger Tracks had already done the yellow Countach thing, but it makes Sunny’s gorgeous, deep, yellow no less a welcome sight. Shiny chrome no doubt appeals to his ego too. Sunstreaker always tackled the car mode completely differently to the Sideswipe/Red Alert mold so it’s fitting that his masterpiece toy follows suit in more ways than just the rear mounted “super tuning” engine. That engine is of course Sunstreaker’s most signature of features but there are other more subtle alterations that differentiate him from is siblings. My eyes detect an ever so slightly “blockier” feel to the vehicle mode but then my eyes are on the verge of going on strike. Plenty of other cosmetic differences are also apparent. Sunstreaker’s spoiler is covered finger print magnet chrome, and the whole rear end of the car is altered to reflect Sunstreakers vintage toy. The distracting, badly lined up panel lines on the side of the OG MP Countach, that looked like someone had fractured it with Mjolnir are banished to the past and instead you get a much cleaner look. No longer does it look like someone drew part of it in the margin of a text book. Below the front grill are what I think are two small air scoops (I am not a car guy!) and where on Sideswipe they are just small holes, on Sunstreaker they have a molded mesh pattern. A very small change that is easy to ignore but that’s why I am sat here hammering away at this keyboard and not doing something more productive like eating a bag of Cheetos and trying to woo a blue alien on Mass Effect Andromeda. Takara slapped this toy with a price tag to match Sunstreaker’s ostentatious persona, but that stabbing pain in your wallet is partly eased by the array of gimmicks he comes equipped with. Previous Masterpiece cars were usually just replica cars and the closest you came to an action feature was the gun could unconvincingly peg on top. Sunstreaker on the other hand comes more fully loaded than a 1998 WWE pay per view and every trick he pulls only increases his allure. Episodes of The Transformers cartoon regularly featured characters using specialist abilities that their toys never possessed, with one such episode showing Sunstreaker using a rear mounted laser cannon to take out poor Thundercracker. 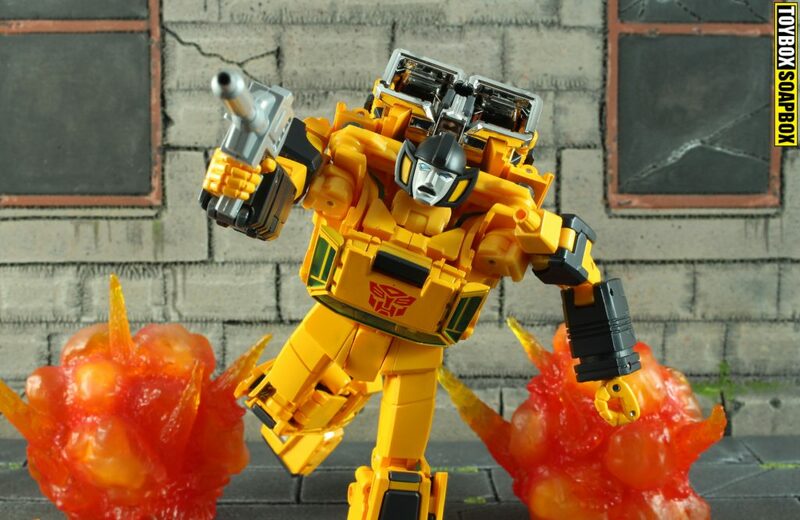 Takara have mostly shied away from integrating these abilities outside of the occasional attachable accessory (unfortunate if you are MP Inferno) but Sunstreaker gets the erect laser cannon firing out of his rear….it writes itself. Other features include an opening hood and doors, but by far my favourite addition is the pop up headlights. Activating these is a simple case of pushing up on pads underneath the car. It’s such a small but fun feature that I never knew I wanted until it showed up here. 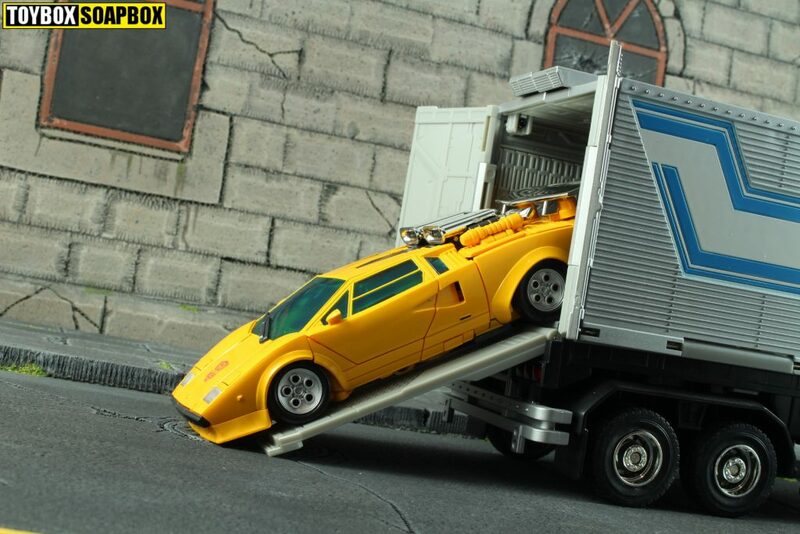 TFC Toys Raging Bull figure, another yellow Lamborghini, also had the opened lights but there it was achieved as a peg on extra rather than being integrated pieces. Already I am pretty smitten, but this isn’t even the most impressive trick Sunstreaker pulls. To satisfy the folks at Lamborghini, the entire back half of the car converts to make a completely accurate Countach. Yes, you get two different vehicle modes out of this guy. Achieving this isn’t even a beguiling Rubiks Cube level task. You basically lift up that the section with the intakes, spin it round and once you close it up you are done. As an added dash of panache from Takara, the rear of the car follows suit and transforms to give a more accurate back end. MP-39 in this form creates a great replica of the Countach and the only concession to the cartoon is the transparent blue underwater windows. Imagine that blokes head from Jaws popping up in there. Just because it’s fluid doesn’t mean it doesn’t have it’s own share of annoyances. Almost every square inch of the figure is covered in paint which can make some of the fit tighter than you may feel comfortable with. Like when you try on a pair of jeans and it says 30″ on the label, but you refuse to accept that isn’t your size anymore. The chest in particular snaps over a clip that worries me each time I go through the transformation and the backpack rotates on a peg that I am convinced is going to snap at some point. As Sunstreaker has to unfold a lot of parts from a small form factor, it necessitates tiny, thin hinges and parts that can feel a bit fragile. There are a few elements like that, which make me question how long this toy will last through repeated conversions. A worry I never had with the previous Masterpiece cars. Complex engineering will always come at a cost when it has to fit into such a small package, so it’s an understandable trade off but it puts a negative spin on what should otherwise be a mass gushing at how brilliant the transformation is. With the emphasis Takara place on cartoon accuracy, the robot that unfolds from the Sunny D-mobile is cartoonish in both detail and proportion. 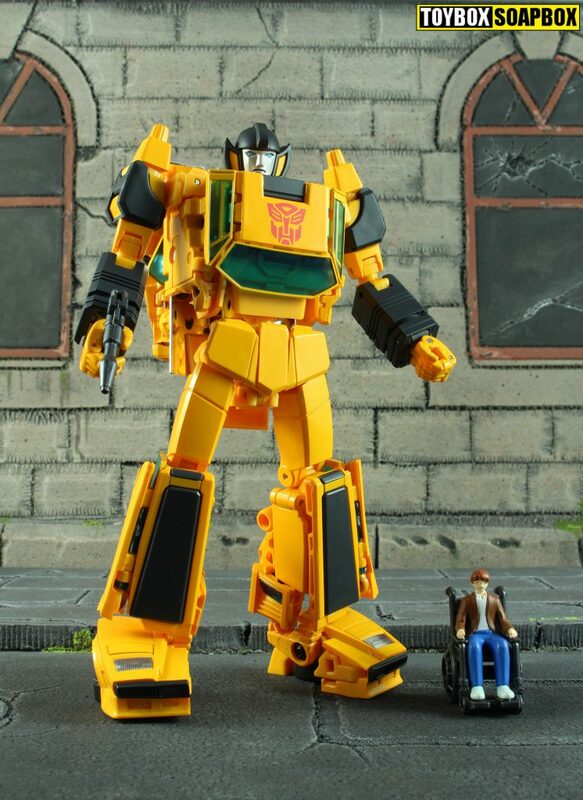 Your idea of what Sunstreaker should look like may be forged in the fires of the age-old battle of toon vs toy, or a bit of both, but I am sure we all accept Takara are currently dedicated to recreating the animation model as closely as possibly – and Sunstreaker probably achieves that better than any previous toy. Gorgeous deep orange juice yellow envelopes most of this toy, with the black plastic, clear blue fish tank windows and massive red Autobot badge adding contrast. Generally I prefer my faction logos to be on the smaller side, but Sunstreaker rocks a bit of a Flavor Flav quality with such a massive badge. The Autobrand sit on top of a chest which shrinks to get the correct proportions. 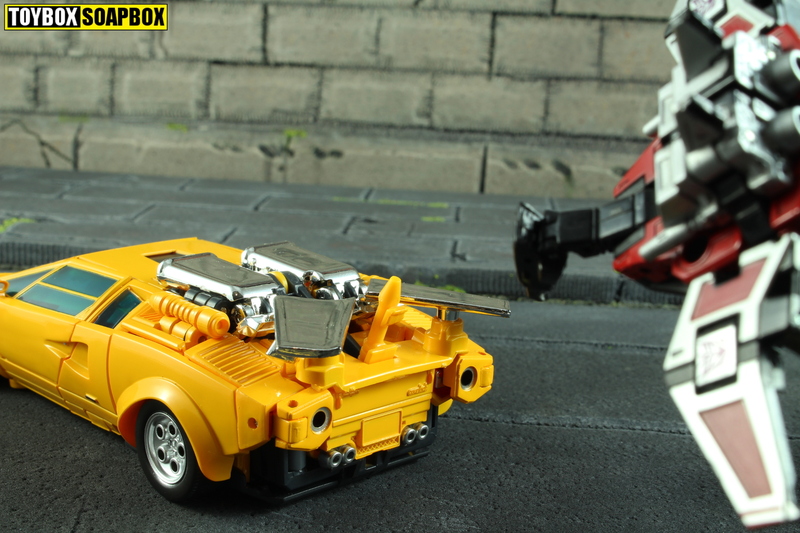 Many people will see this as an unacceptable cheat, but unlike Badcube’s Sunsurge who went with a fake chest, MP-39 manages to still use the car modes actual roof, but flips it round and fakes the windows. So still a cheat but technically less of a cheat. 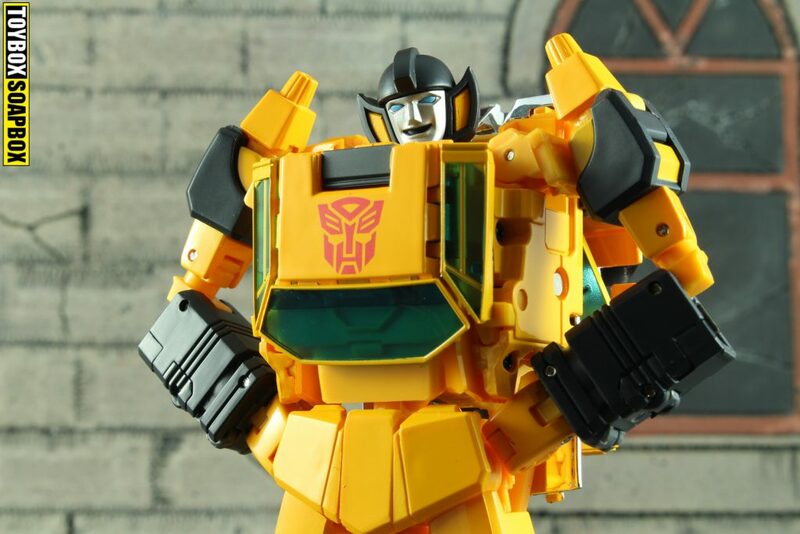 Small details have been copied, with lines crossing the body in the same places they do on the animation model and Sunstreaker’s waist panels even taper underneath to ensure they sit against the thighs and give his waist that diaper look of the show. 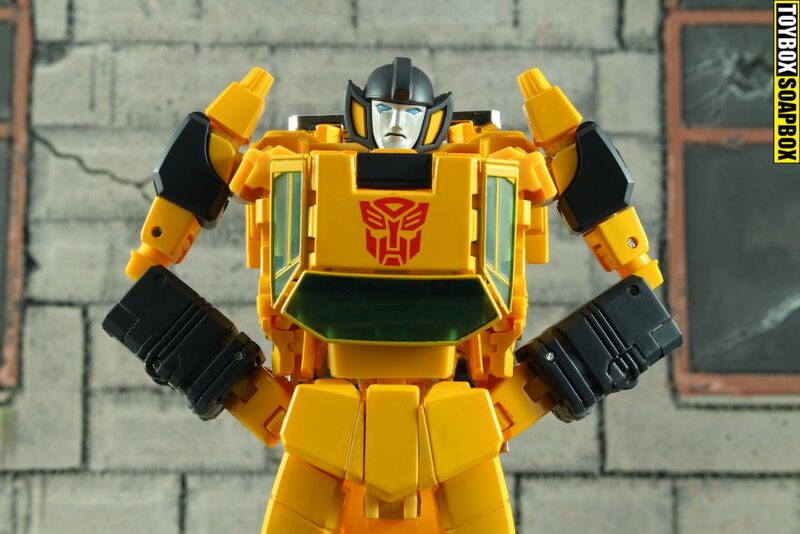 There’s an obsessive eye at work here who has stayed up late on many nights drinking Red Bull and eating take away, in order to get the most slavishly accurate Sunstreaker of all. Whoever this designer is – they clearly did not want to break the illusion. It would be remiss of me to ignore his signature silver intakes which sit proudly behind his head like little silver chimneys that are going to confuse Santa on December 25th. Somethings don’t carry over so well to three dimensions and whilst Sunstreaker has a stunning body – his face is like plastic Marmite. I like the face but there’s no denying its divisive and some folks are going to love it with others destined to hate it. You get three difference face options but they all suffer from the same severe Jimmy Hill chin. The angry face gets away with it a bit more, as that face is supposed to be more contorted than the others, but it still never quite looks right. Such a strong chin curve isn’t a feature of the animation model, so it’s presence here is as baffling as it is distracting. It could have done with a bit more refinement. A nice compromise would have been to include an optional head that featured a modern look, but then that would have gone against all of the principles that this toy strives to achieve. Wake up third parties accessory elves – your time is now. Options are important as they told us at school in year 9. Also, for avoidance of doubt – I hate Marmite. Just as much thought and consideration has gone into how this figure moves, as how it looks, and MP-39 sets a new standard in the line for articulation. Never had I felt that the other Masterpiece figures were lacking for articulation until this guy rolled into my life. It’s like the difference between a a Marvel Legends figure and a Figuarts toy. Or a packet of Nobby’s Nuts and KP Dry Roasted Peanuts. One is fine, but the other is a different class. There is all of the standard articulation you’d expect but then you get extra joints at the shoulders that allow the arms to cross the chest, the wrists have an extra hinge that allow the hands to sit palm upwards in a “Stop! In the name of love” pose. Hip panels rotate around the thigh to avoid getting in the way which is a clever solution to hip’s blocking movement and it means Sunny can almost kick himself in the face. The feet have an excellent range of motion and their large, flat base gives Sunny fantastic balance and combines with the ab crunch to facilitate anime style posing. And that is in spite of the large chunk of car hanging from this toys back which surprisingly doesn’t make the figure back heavy. 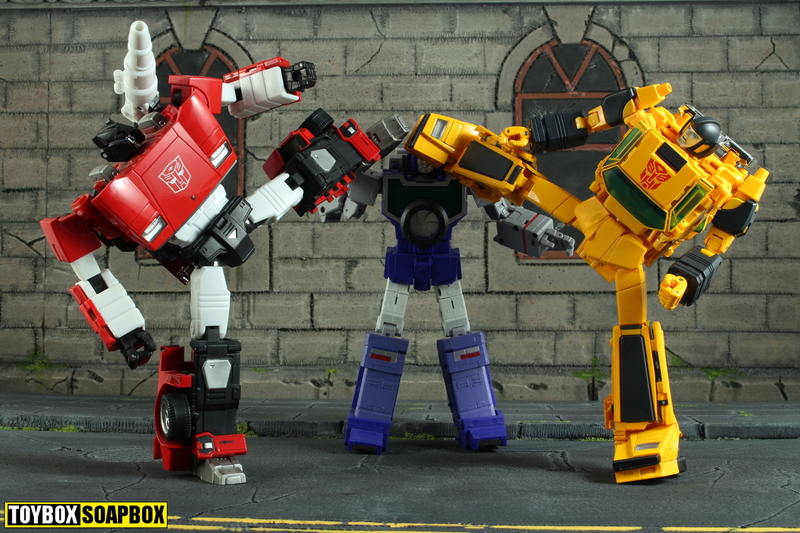 A head on a ball joint is nothing to throw a party in aid of, but the neck connects to a panel which itself moves and allows Sunstreaker to look down or to provide clearance for the head to look up if you want to put him in a flying pose. Even his thumbs move. Most people might be wondering why that is important and it’s because it allows him to get a very firm grip on the gun. One of the minor things that I have griped about with Masterpiece, is that so many of them have foibles when it comes to holding weapons. Sometimes they hold them too loosely and they will fall out if sneeze half a mile away. Others are a sod to get the weapons into the hands and even worse to get back out. So being able to adjust it yourself is a very small, trivial thing, but it it’s a nice touch and a symbol of how well thought out everything is. No hindrance or compromise gets in your way when you try and move this figure. Everything is natural and free for you to do whatever you wish with the greatest of ease. It’s a toy that wants you to stretch your imagination and pose it. This is the bar now, and not one of the many I like to get drunk in. If you are wondering how this thing holds together then the answer is tightly. Certain transformation joints were overly tight, but in robot mode the balance is much better. None of the joints are painfully stiff but neither are any loose and nothing is going to flop if you are determined to wave it about. He will easily hold you favourite pose with no fuss as discussed at great length above. So much paint covers this thing though, that it’s inevitable over time that you are going to see paint chipping. It looks beautiful, using paint means most of the parts colour match (but not all) and it’s lovely on your hands, but it’s going to limit how often some folk move or transform this toy. That is such a massive shame considering how great the transformation is and how fun the toy is to pose. 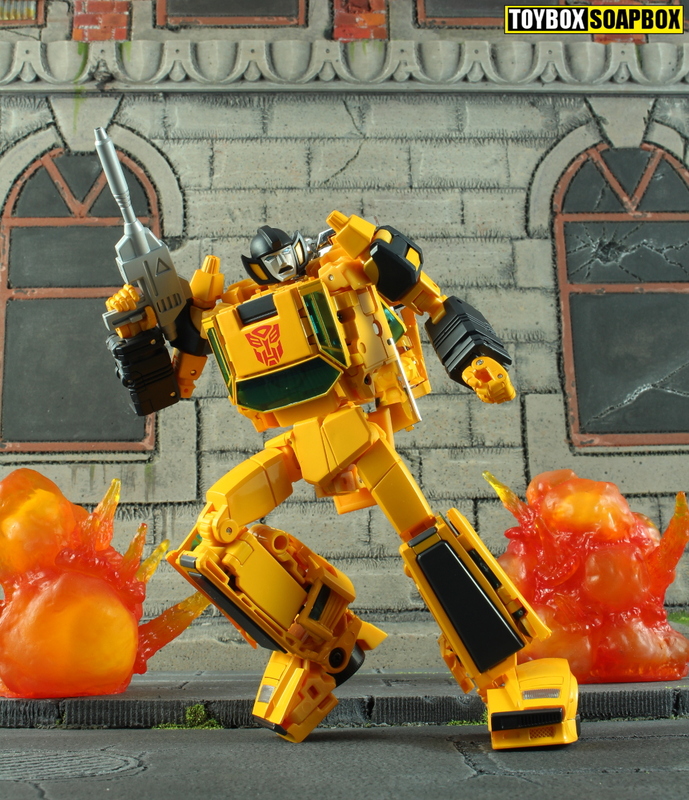 I may be over exaggerating but the wounds of flakey chrome MP Hot Rod still run deep. At least the chrome on my Sunstreaker seems to be more robust. Bet I’ve jinxed it. Inside of Sunstreaker’s box sits a tray laden with accessories which help to drive home why this toy is so pricey. Included are two alternate faces, a mask, two guns and a Chip Chase minifigure. A reasonable bounty. With Sunstreaker being the first of the Diaclone transforming robots you’d expect his vintage toy accessories to be part of the set but these are omitted in favour of cartoon centric offerings. His rifle is uninteresting until you put it side by side with Sideswipe or Red Alert and notice it’s a cartoony version of the same gun. Everything is there but the detailed dialed back to make it fit into the cartoon aesthetic. Takara could have taken the easy path and just repackaged the older gun but they’ve gone to the length of creating a new design. Of the old design. A much smaller pistol is also included that can fold up to store in the back of the car mode, or concealed within his robot shins. Both weapons can store at the same time (the rifle pegs onto his back) which is unique amongst the Autobot cars. As mentioned earlier, Sunstreaker comes with three faces to pick from. One is an awkward looking smile that makes him look like a pixie, the other is your usual angry shouty face. Neither of them makes much of a case for usurping the stock, neutral expression nor will they do much to ease the concerns of the “I hate that head sculpt!” crowd. An alien mask from “Hoist goes Hollywood” is an option if you wish to recreate that particular episode of the cartoon. The final accessory arguably trumps the rest and is a little melty face Chip Chase figure. His chair wheels don’t roll and there is no articulation but he does a decent job of being another ornamental friend to the Autobots. As this review has taken me two months to finish, I have had an unusually long time to mull over my thoughts on MP Sunstreaker, debating whether it was the correct choice to put him so high on my best of 2017 list or whether I’d been swept up in a mix of new toy glow. Picking him up again now, my initial instincts were correct as he is still completely magical to behold. The cartoon aesthetics may not be for everyone, but if the articulation and engineering is an indication of what the future of Masterpiece holds then I am all for it. Jazz and Mirage in particular deserve this level of articulation to portray their characters. Recently my interest in Masterpiece was beginning to dwindle as the line shifted toward Beast Wars, which is not for me, and Generations continued to rope me in with small bites of plastic joy. But this toy reminded me why I have several shelves of MP figures like some sort of shrine to a Japanese toy company. Sunstreaker is a reminder of what Masterpiece is at its core, a realisation of a character with new tricks that advance what a toy is capable of. It’s an ideal. Takara are always at their best when they push the envelope and with this toy they have redefined what a Masterpiece car should be.